There are many ways to support Bright Lights all year long! Help take learning beyond the classroom! Quality summer learning is a vital part of students’ academic success. 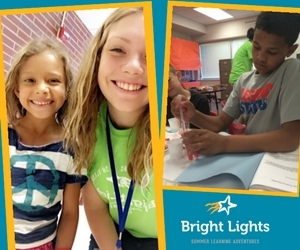 Bright Lights provides programs that promote and enhance creativity, the mastery of new skills and keep students from the “summer slide.” YOUR support, dedication and enthusiasm preserves Bright Lights learning programs. General Fund giving contributes to the overall operating costs of the program, including: health and safety, insurance, background checks, materials and teacher salaries. Program fees cover roughly half of operating expenses - the rest comes from our community and people like you! Give to Lincoln Day takes place on May 18th and donations made through the Bright Lights page are proportionately matched by the Lincoln Community Foundation. This year online donations are accepted from May 1-May 18th. Voluntary Price Option provides registrants the opportunity to cover the entire cost of the class, whereas the program fee only covers 54% of the actual program cost. Choose from three voluntary options when you register for a class! Dine & Donate fundraisers are hosted by Bright Lights at local restaurants throughout the summer. These restaurants generously give back a percentage of proceeds to Bright Lights. Check our webpage or social media channels for upcoming opportunities to participate! Volunteering as a Classroom Assistant is an opportunity to help support the teachers, ensure student success, and provide a rewarding experience that makes a difference in the classroom. Volunteer assistance is something we always appreciate. Giving of your time is incredibly valuable to us and we would love to have you volunteer your time at Bright Lights! Simply apply to learn more and get started. To learn more about supporting Bright Lights, please visit https://www.brightlights.org/support, and remember to visit Give to Lincoln between May 1 - 18. Your continued dedication and Lincoln’s enthusiasm for Bright Lights keeps our summer program for children strong.